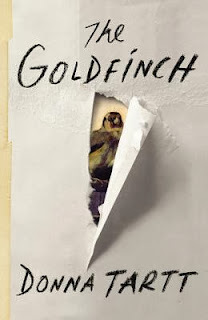 I am almost half way through Donna Tartt’s The Goldfinch, having joined the virtual challenge at classicvasilly on wordpress. I panicked when I joined last Sunday thinking oh how am I going to get through this big fat book by year’s end? So I put aside the very slim Olive Kitteridge, which I was loving. My reading of Olive Kitteridge is much slower. I read through Olive’s prismatic character; each chapter is a linked short story that subtlety or otherwise reveals some shade of Olive’s self. In some chapters, she’s merely peripheral; in other’s dominant. But this, for me is slow reading as I piece together this wonderful, somewhat crotchety retired schoolteacher living, as I once did, in a small Maine town. What’s next: I am looking forward to both looking back on the year and looking ahead to some goal setting—so unlike me. I am considering new challenges. Happy holidays bloggers an others. I have learned so much from all of you this year. That's where I am at too: looking back on the year and looking ahead to the new year. I don't think I'll be doing any formal challenges this year and probably will continue with my informal challenge of reading whatever I want, which seems to be working for me. I wasn't planning to read Tartt but have heard so many people laud it, that when an offer came up yesterday to get it for £1.99 on Kindle, I had to go for it. And then had a moment of doubt whether I would ever get to actually read it. You just persuaded me that I really should do it soon. Oliver Kitteridge is one of the most beautiful books I have ever read and thank you so much for reminding me that I still have Strout's most recent novel to read. I must add it to the top of the tbr pile as soon as possible. The Goldfinch is already there, but even though in theory I know I should have more time for reading over the Christmas period somehow it never quite works out that way. Nevertheless I do intend to get to it as soon as possible, so it's good to know that it's an absorbing read. I'm also finding The Goldfinch to be an absorbing read. The death of one parent and the chain reaction it brings. . . There are passages that I've had to underline and re-read.